He is a beast of many horns and ever thus has been. And brandy of logwood hue. To make a man turn blue. For there’s rum, and gin, and beer, and wine…. For there’s no rum, nor gin, nor beer, nor wine…. * To sing the full chorus on the last two verses, repeat the last two phrases of the standard chorus, or use the “full” melody given below. Another song from the Hutchinson Family, for whom see the notes to “Uncle Sam’s Farm” in the PDF songbook. This is perhaps their favorite temperance song (that is, song devoted to banning the sale and consumption of alcoholic beverages). It was songs like this that encouraged the passing of Prohibition in the 1920s — but that was long after the Hutchinsons had left the stage, so they did not know how ineffective the campaign would be. Source: I found the words for this in The American Bicentennial Songbook, by William R. Ward. But the tune posed a tricky problem. Ward states that the Hutchinsons took the tune for a song called “King Andrew” as the basis for this piece. The literary dependence will be obvious. “Lou” is probably Lewis Cass, who held many cabinet posts, including Secretary of War under Jackson from 1831, and eventually became a Democratic presidential nominee (he lost to Zachary Taylor of Santy Anno fame). “Ben” is Benjamin F. Butler, Jackson’s Attorney General after 1833. “Lev(i)” is Levi Woodbury, secretary of the Navy from 1833. “Bill” is postmaster William Taylor Berry. “Roger of Tawney Hue” was Roger B. Taney, he who would later manage the Dred Scott Decision; he was Jackson’s Attorney General from 1831, then took over the Treasury in 1833 (helping Jackson suppress the Bank of the United States), then Chief Justice. “Blair” was newspaper publisher Francis P. Blair, head of a political dynasty that was still influential as late as the Civil War. “Kendall” was Amos Kendall, a journalist who supported the administration. “Isaac” was Senator Isaac Hill, a close Jackson ally. And Humphrey with his flail. To carry the milking pail. She did begin to bawl. ‘Twas Moll and Bet and Doll and Kit…. 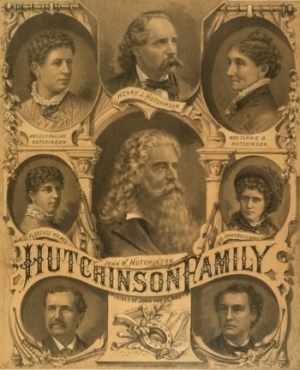 The music at the top of the page, therefore, is “Dame Durden,” not the Hutchinson family tune.